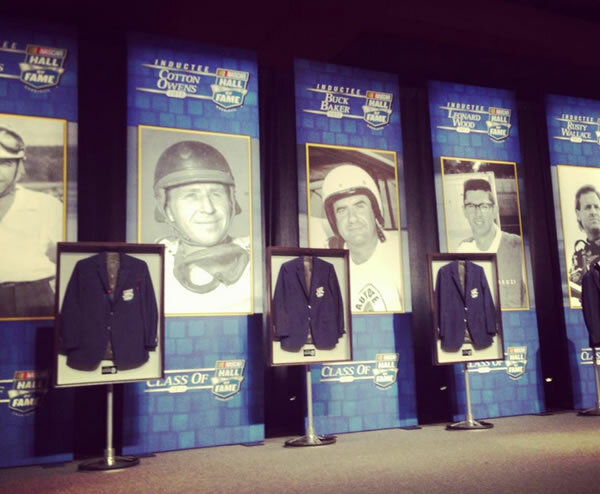 There are concerns that the NASCAR Hall of Fame won't be as relevant as more of the sport's deceased heroes are inducted. There are concerns fans won't pay homage to the Curtis Turners and Fireball Roberts as fervently as they will living heroes because they never saw the older drivers race. The concern grows stronger as you look ahead to the next couple of classes, when the number of deceased entries could -- and likely should -- dominate those who get inducted. Fourteen of the 20 names left from the list of 25 used for this year have passed away. As long as there are storytellers like Buddy Baker and Ned Jarrett, as long as there are family members who can intimately share details that made their fathers heroes to them and others, the stars of yesterday will live forever. And the Hall shouldn't suffer. 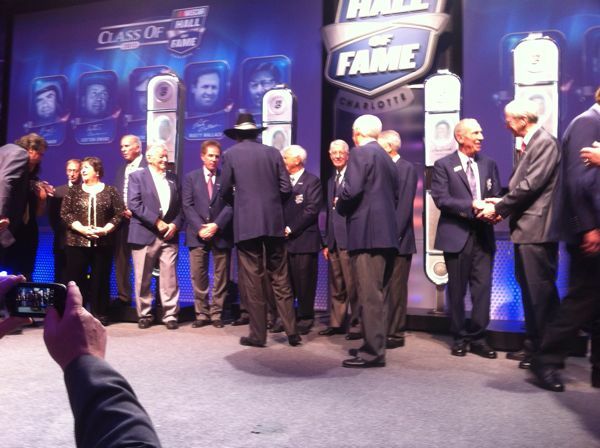 Buck Baker, Cotton Owens and Herb Thomas weren't here to remind us of how great they were as Rusty Wallace and Leonard Wood were Friday night when NASCAR inducted its fourth class. One of the best moments of any induction ceremony came from Kyle Davis, who said the four life principles his grandfather Owens lived by were: "God, family, country and the 426 Hemi." There were other such moments. Reigning Sprint Cup champion Brad Keselowski toasting Wallace -- who made the No. 2 Penske Racing car famous long before Keselowski -- with a Miller Lite bottle was classic. Just seeing David Pearson, a member of the shrine's second class, unfold a wrinkled piece of paper with notes for the Owens ring presentation and then say "can't half see" was worth the price of admission. Pearson, for those who don't remember, wasn't so media savvy back in the day, but he has embraced the Hall. Adding current drivers Carl Edwards (Thomas), Mark Martin (Owens), Trevor Bayne (Wood), Jeff Gordon (Baker) and Keselowski (Wallace) to the ceremony to introduce each inductee's video also was a nice touch. Remember the criticism when many of today's stars didn't show for the first induction? Seeing 11 of the 12 living Hall members on stage -- Cale Yarborough apparently couldn't make it because he was at a Boy Scout fundraiser -- was memorable, as well. We learned a lot, such as Wallace saying Hendrick Motorsports owner Rick Hendrick paid half of what it took to keep the Raymond Beadle team afloat in Wallace's 1989 championship season. "Back then, it took about a million to run a team," Wallace said. "I'd say Rick put up close to $400,000, I guess." But what we really learned is it doesn't -- or shouldn't -- matter if the inductees are living or dead. Wallace shouldn't be told one of the reasons he was selected was because he continues to be a great ambassador for the sport, which makes him a great ambassador for the Hall. Wallace is here because his record -- 55 wins (ninth all time) and a championship in 1989 -- demanded it. That always should be the criterion. Friday's show was as good as any of the past two years, when four of the five inductees were living. The video of legendary mechanic Smokey Yunick saying Thomas was the greatest driver of his time was as eye opening as anything said all night. In many ways, the ceremony was better thanks to people such as Buddy Baker, son of Buck, who eloquently filled in the blanks on so many of his heroes and fellow drivers who made the sport what it is. On Thomas: "I didn't have an opportunity to get to know Herb very well, but I do have a pit helmet they wore. I have his autograph, Fireball Roberts and a bunch of them on there. … [Thomas] didn't look like a driver. He didn't talk like a driver. But man, he had some talent." On Owens: "I remember winning the Southern 500 [at Darlington in 1970] with him. I had a huge lead, several laps in front of everybody. Cotton had never won that race with any driver, and, him being from South Carolina, he had expressed how much it meant to him to have a car that was on the front row first off, but then to have one leading the race near the end. "He came to me on the radio late and said, 'This is a dream come true.' About that time, I cut it sideways just cutting up coming off Turn 4. He said, 'Baker, I got to tell you, if you wreck that car, I'll kill you.' "
On Wood: "I raced for Leonard. In my opinion, one of the best all-around mechanics of all time. He and Harry Hyde, they could make music with what they did. When he built a front end, holy cow, it almost drove itself. And I wasn't used to that." On Wallace: "I tested with Rusty on his superspeedway stuff. He paid me one of the biggest compliments of all time. He had run about half of the day, and he told me to hop in it and see what I thought. Well, first of all, I don't think he thought I would get in it because of my height. I got in, and he looked at the charts on the computer and all and said, 'Tell you what. You just drive it, and I'll work on it.' That was a heck of a compliment coming from him." On his father: "He was one of the guys that always liked to dress nice, and his hair was always just [right]. They have a video of him right after a crash, and he's standing there combing his hair. He dressed well, but don't let the clothes fool you. He was a Dr. Jekyll and Mr. Hyde when he got aggravated. He was one of those guys you didn't want to mess with. "My dad, he would have been my hero if he was not my father for the way he drove a race car." Baker could have gone on and on about all of them. Other family members and presenters could have, as well. They all made the audience feel like a part of the inductees lives in a way few could. They made you realize it doesn't matter whether those selected are living or dead, that being deserving is what really counts. Who cares whether next year's class -- which will be named later this year -- consists of Roberts, Turner, Tim Flock, Fred Lorenzen and Joe Weatherly, all but Lorenzen deceased but all who should be considered strongly over living legends such as Rick Hendrick and Richard Childress. Richard Petty said the pioneers should have gone in before him. He was wrong. Nobody should go in before NASCAR's all-time wins leader. But the time for the heroes who no longer are with us to go into the Hall has come without the worry of remaining relevant or making a profit.